The US ambassador in Iraq is to hold the first high-level talks for decades with officials from Iran, a country with which it has no diplomatic links. But the US State Department said Zalmay Khalilzad had a narrow mandate to focus only on Iraq, and that the talks would not affect bilateral relations. 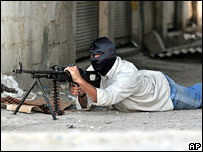 The Americans are expected to ask Iran to help strengthen border security. The US broke diplomatic relations with Iran after Americans were taken hostage in the US embassy in Tehran in 1979. Mr Khalilzad, a former ambassador to Afghanistan, revealed he had government permission for the meeting in Monday's issue of the magazine Newsweek. "I've been authorised by the president to engage the Iranians as I engaged them in Afghanistan directly," he said. "There will be meetings, and that's also a departure and an adjustment." State Department spokesman Sean McCormack confirmed President Bush had given permission for a meeting, but played down its significance. "It's a very narrow mandate that he has, and it deals specifically with issues related to Iraq," he told reporters. Mr McCormack said he was not certain what would be discussed in any future meetings, but suggested security along the Iran-Iraq border might be one subject. "If there is a particular issue to discuss, to try to resolve... I'm sure that there will be a meeting," he added. The US is also seeking to open negotiations with some of the insurgent groups involved in the violence that has plagued Iraq since the invasion in 2003, Mr Khalilzad says. He told the US broadcaster ABC on Monday that he would talk to anyone except militants from Abu Musab al-Zarqawi's group, al-Qaeda in Iraq, or those loyal to former Iraqi leader Saddam Hussein. "We are reaching out to everyone but two groups: the Zarqawi group and associated forces who are jihadists... and the Saddamists - those who want Saddam Hussein to return," he said. "I believe you cannot win the kind of conflict we are facing by military means alone... You need to have an integrated approach that wins populations over." 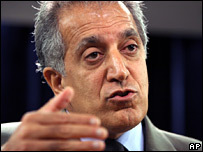 Mr Khalilzad said he hopes to negotiate with Sunni Arab groups in particular. "If we want an Iraq that works we need to bring the Sunnis into the political process," he said. "We have in recent periods sought the help of countries, Sunni Arab countries to facilitate that, to encourage that."